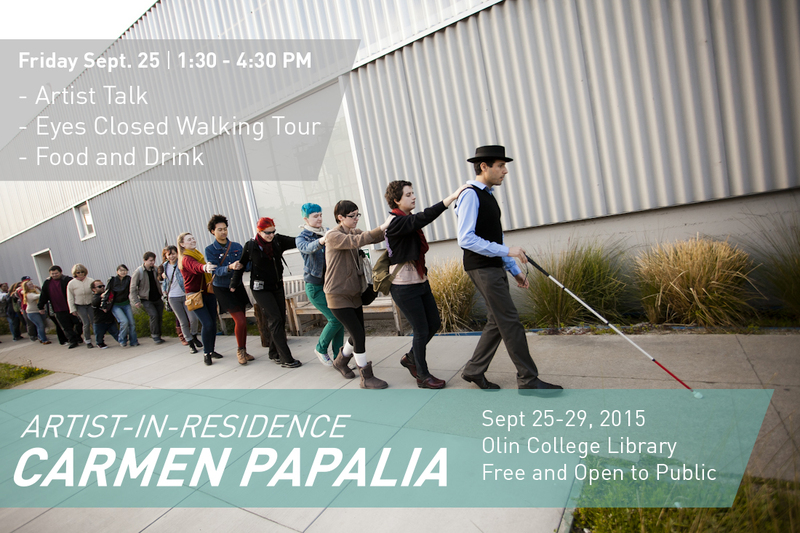 carmen papalia at olin, 9/25-29, and more collaborations | Abler. This fall’s version of Investigating Normal will include several dream collaborators: Lacy Gillotti of NEADS, a service dog training organization, Alex Geller of Fathom Info, with whom we’ll be exploring disability and the school-to-prison pipeline, Mel Chua, a postdoc at Olin who is deaf, has spent her life “passing” as hearing, and will be getting a cochlear implant this fall, and Carmen Papalia, an artist who’s blind and has a complicated relationship to the white cane. Carmen will be here from September 25-29, doing an artist’s “micro-residency,” or so we’re calling it at Olin. There are events on Friday, September 25 in the Olin Library that are free and open to the public. We’d love to see you there.